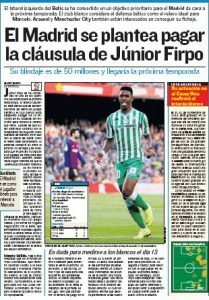 On December 4th, we relayed news from Spain, who claimed that Manchester City are following Real Betis’ Junior Firpo almost every match. A day later, El Desmarque reported the La Liga outfit were planning to hold on to to the star until the end of the season, amid interest from Arsenal. The 22-year-old, who has a €50m clause, gets a mention on the front page of Thursday’s edition of AS with a headline saying ‘Objectivo Junior’ for Real Madrid. They have identified him as Marcelo’s successor at the club as the Brazilian will turn 31 next May. It is explained the Gunners and Pep Guardiola’s side are interested in the left-back, but Los Blancos have made him their ‘priority target’ next summer. The Champions League winners have Sergio Reguilón as a backup to the Brazilian after Theo Hernandez struggled to impress, which saw him join Real Sociedad on a loan deal. The Frenchman will be sold next summer, which will clear the space for them to bring in Junior. Real are aware that there are other clubs interested in the Betis defender, which is why they plan to pay Betis his release clause and not enter into any negotiations with the Spanish side. If the Spanish capital club manage to land Junior, AS believe it will be a blow for Arsenal and City as the two clubs were chasing the player for a while.